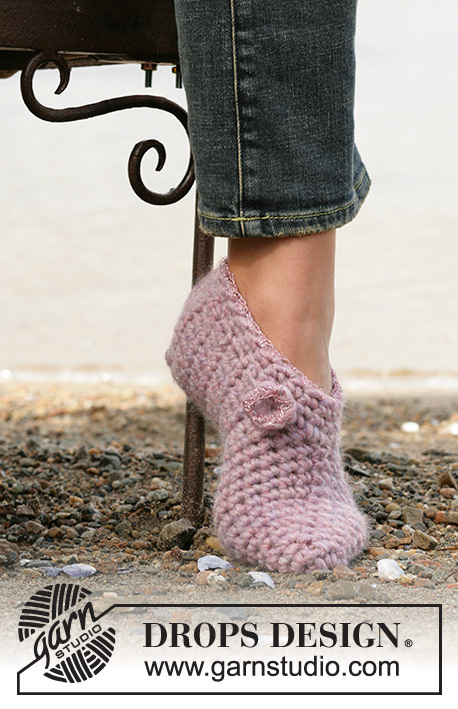 Crochet: How to work a slipper from the toe, back to the heel and leg. 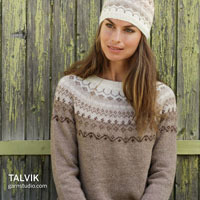 Go to original pattern for design DROPS Extra 0-407. 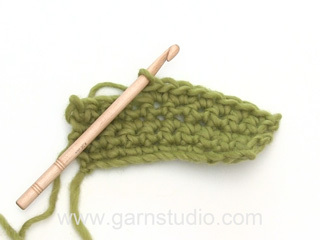 DROPS crochet hook size 8 mm / L/11 - or size needed to obtain the correct crochet gauge. Crochet gauge: 11 sc = 10 cm / 4'' in the width. Substitute the first sc at the beginning of round/row with 1 ch. 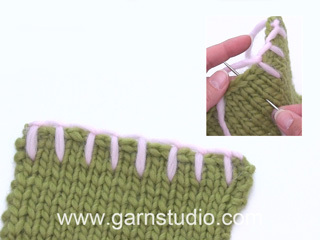 Finish each round/row with 1 sl st in the ch from beginning of round, (in the ch from beginning of previous row when crochet back and forth). 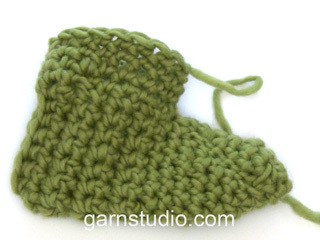 Slippers: Crochet the slippers on hook size 8 mm / L/11 with 1 strand of Eskimo and 1 strand of Glitter. 1st round: Ch 3 and make a ring with a sl st in the first ch. 2nd round: Crochet 5-5-6 sc around the ring – read crochet info! 3rd round: 2 sc in each sc = 10-10-12 sc. 4th round: *1 sc in the first sc, 2 sc in the following sc*, repeat from *-* = 15-15-18 sc. 5th – 7th round: Crochet 1 sc in each sc. 8th round: *1 sc in the first sc, 1 sc in the second sc and 2 sc in the third sc*, repeat from *-* = 20-20-24 sc. Continue to crochet 1 sc into each sc until the piece measures approx 11-13-14 cm / 4½"-5"-5½". 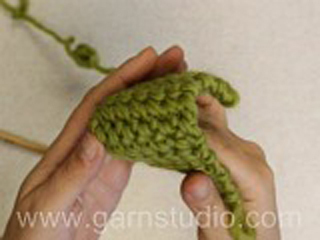 Now divide the piece and crochet back and forth from the mid top of the foot – remember crochet info. 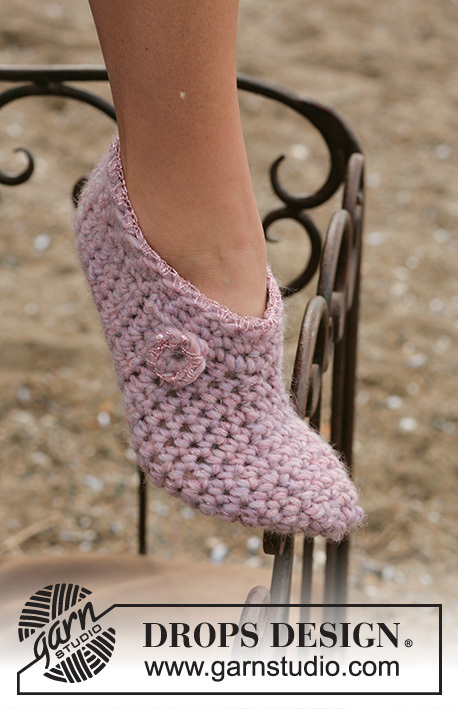 When the slipper measures approx 22-25-28 cm / 8 3/4"-9 3/4"-11" lay it double and crochet tog at back of heel with a row of sc through both layers. Crochet 1 round of sc around the opening of the slipper – begin mid back. Continue with 1 sc in each sc for another 2 rounds. Continue to crochet 1 round with 3 strands of Glitter as follows: 2 sc in each sc. Ch 3 on hook size 8 mm / L/11 with Eskimo. Make a ring with a sl st in 1st ch. 1st round: crochet 8 sc around the ring. Finish with a sl st in the first sc at the beginning of round. 2nd round: Crochet 1 round with 3 strands of Glitter with 1 sc in each sc. Put a bead on the threads at the middle of the flower before sewing the threads. Sew the flower onto the slipper in between the edge and the foot. Hi. I am a European size 41. As the second size ends at 40 and the third size starts at 42, could you please advise which size I should make to get a 41? Dear Susan, if your feet are quite thin work rather the 2nd size working more rounds to get finished measurements if necessary, otherwise you can work larger size and adjust height - in both case try on the slipper to adjust length. Happy crocheting! I really need some help. I literally do not understand this pattern. I have tried several times to do this pattern and each time it looks like a deformed flower. Is there another way you can word the pattern or show me an actual video of it please? Dear Zoe, for any individual assistance, you are welcome to contact your DROPS Store they can give you also any tips & advice. Happy crocheting! Dear Zoe, slippers are worked in the round; starting from the toe with inc to the opening of leg, then worked back and forth, and finally placed double to crochet back of heel tog. Crochet then a border around the opening for leg. You will find relevant videos to that pattern under the tab "video" at the right side of the picture (ring of ch, sc/dc, increase, crochet tog...). Happy crocheting! Dear Mrs Hall, please click here to get the pattern for the slippers. Happy crocheting! Dear Lindsey, start crocheting back and forth from beg of round, but instead of joining, turn and work from WS until end of row on all 20 sts. Turn again and work from RS until end of row. The beg of rows are now on the top of foot. Happy crocheting! Dear Riaana, this pattern is written in 3 sizes, on 2nd round, you work 5 sc in 1st and 2nd size and 6 sc in larger size. You then inc from round 3 until you get 15 sc in size 1st + 2nd size and 18 sc in larger size. Happy crocheting! I just want to know where do I get the crochet info? Dear Riaanna, the crochet info is at the beg of the pattern, under "Crochet tension". Happy crocheting! Trying this pattern for the first time. Totally lost on heel instructions. What does "lay it double" mean and how do I jump from mid top of the foot to back of heel? Is something missing? Thanks in advance for any understanding you can give. Dear Linda, I'll suggest you to have a look on this video called "Crochet pieces together" (cf video index) to visualize how you will crochet the back of slippers. Happy crocheting!